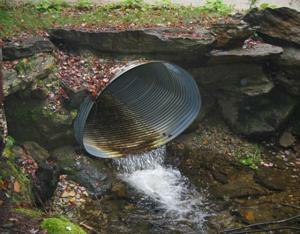 Bridges and culverts can be barriers to fish passage, fragmenting the stream habitat. We more often hear about "habitat fragmentation" in terms of land conservation. But our rivers and streams are linear habitat systems, and are often the only corridors of natural habitat connecting parcels open land. It is not just fish that use the stream habitat. Creatures that live along the streams such as river otters and muskrats, even terrestrial animals will utilize the safe passage under bridges or through culverts if they can. Our streams are fragmented where they cross our extensive system of roads, railroads, driveways, and pathways. Each crossing poses a potential barrier to passage. And there are 2,300 road crossings in the Sudbury, Assabet, and Concord watershed, each of which is a potential barrier to passage. OARS has completed two major projects that assess continuity and identify barriers to aquatic and riparian life. The Nashoba Brook survey of 2010 is below. The trout stream assessment in the Hop Brook (Sudbury River) subwatershed was completed in 2013 as part of OARS' work on climate change. The objectives of this project were to identify, survey, assess, road/stream crossings in the Nashoba Brook and Fort Pond Brook subwatershed of the Assabet River as barriers to fish and wildlife passage and to prioritize problem crossings for remediation. In collaboration with Conservation Commissioners from the Towns of Acton and Westford, OAR volunteers used a regionally accepted methodology to assess over 60 stream crossings in the Nashoba and Fort Pond Brook watershed. Volunteers contributed an estimated 200 man-hours of field work to the project. Of the 60 crossings surveyed: 13 met general or optimal standards, 34 were rated minor barriers, 8 were rated moderate barriers, and 3 were rated severe barriers. The final report will be posted here (check back!) and follow up planned for the crossings rated as moderate or severe barriers. Thanks: Thank you to all our volunteers for all their work, to the Massachusetts Environmental Trust. for funding, to the River and Stream Continuity Project and Massachusetts Division of Ecological Restoration for technical help, and to ESRI Conservation Project for GIS mapping software. Statewide "River and Stream Continuity Project"